I have made a new scarf for Blythswood care and this time a horizontal scarf. 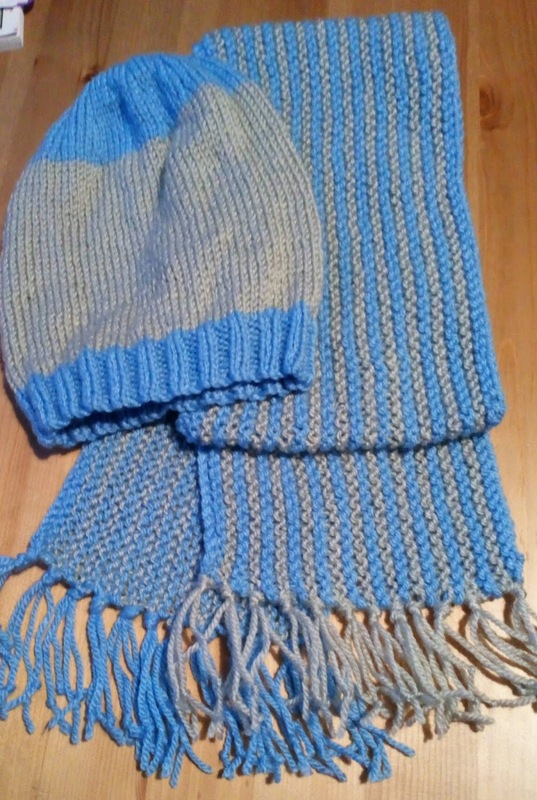 I used DK yarn blue and light grey casting on 210 stitches on 5mm needles. 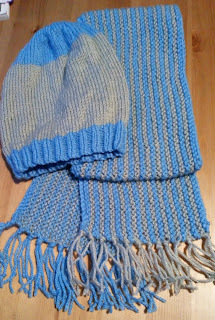 I used garter stitch and changed colour every 2 rows, I kept knitting until the scarf was 6 inches wide. This made a scarf 49 inches long so a good length for a child. I added a hat as well in the same colours so it can be used with the scarf or not depending on what they want to do it. These will be sent off with the first scarf I made with e flower on it, I hope they will prove useful. I will sort out yarn for next scarf and may use a pattern I have stored away, it will make the scarves I send all different and fun to knit. A lovely little matching set. Someone will be warmer this winter, thanks to you.